Quick Post: I assure you this tastes much better than it looks! I could not get a decent picture of this because it was raining the night I made it, so no natural light! I’m also not fond of my flash mode – blah! I’m a little embarrassed to show the picture because pictures “sell” recipes – but this one has great flavor and I would make it again. Thanks for reading, enjoy! Preheat oven to 400. 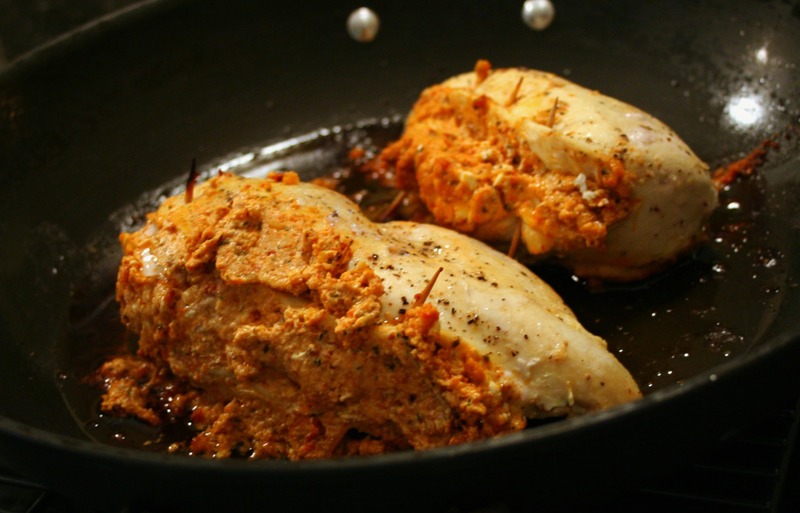 Spray an oven-safe saute pan with olive oil or cooking spray and heat over medium-high. Using a pairing knife, cut a pocket in each chicken breast, cutting as close as possible to the edges but taking care not to puncture all the way through. Mix the sun dried tomato pesto and goat cheese together in a small bowl then stuff each chicken breast generously with the mixture. I used toothpicks to secure the opening as much as possible. Season the tops with salt and pepper. Place top down in the skillet and cook for 3 minutes, until nicely seared.